Beautiful, fat berries ready for picking! 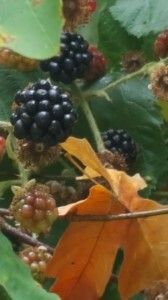 Our move to Bainbridge means we have enough land to have a little patch of wildness where the blackberries are growing. In Seattle, blackberries in your yard have to be dug out relentlessly or they take over and no one has space for that. So, you go picking in the vacant lots or next to the Burke Gilman trail and you bring a ladder or a step-stool if you expect to find anything left. All the low hanging fruit will have been picked by casual strollers unless you get lucky and time it right. But here, I was able to walk out my back door and pick all I needed for multiple desserts! Blackberries, however, are not without their perils. If you go picking, even on a hot day, you have to wear long pants and long sleeves to protect yourself from the thorns. And even then, you’ll feel like the bushes are alive and determined to keep you from taking their precious berries. My picking expedition went something like this, “Wow, beautiful….ouch! Let me go!” ” Oooooh, those are nice and fat….OW! Quit grabbing me!” It feels a bit like you’ve been dancing with a poky octopus by the time you have enough berries for a dessert. But as you nurse your scratched arms and you look down at that bucket full of glistening, fat berries, you’ll feel a sense of accomplishment that makes you forget all about the pain. Even better is if you go with a friend or a child. It turns it into an adventure you can recount later, especially if you come home after and make a cobbler to share. I took my stepson out picking once when he was about 8 years old and he loved it, and the following cobbler, so much that he wanted to do it again for his birthday party! A wonderful way to celebrate the winding down of summer. My cobbler recipe is here: raspberry cobbler. Just substitute blackberries for the raspberries. 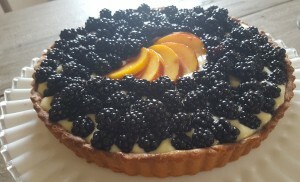 Another more elegant way to celebrate these berries is to make a fruit tart. This recipe from Dorie Greenspan’s cookbook Baking Chez Moi has become one of my favorite go to desserts for showing off summer fruit. You do want to start making the components of this tart the day before you want to serve it, so if it’s a lazy summer day, go for the cobbler above. This dessert is for when you have some extra time and feel like baking. If you’re looking for a new cookbook to inspire and grow your baking skills, this is a good one. Leave the pastry cream on the counter for 10 minutes, then whisk in the butter until fully incorporated and the pastry cream is smooth and silk. Press a piece of plastic film on the surface of the cream and refrigerate until it’s thoroughly chilled, at least 2 hours. Put the flour, confectioners’ sugar and salt in a food processor and pulse a few times to blend. Scatter the pieces of butter over the dry ingredients and pulse until the butter is cut in coarsely– you’ll have some pieces the size of oatmeal flakes and some the size of peas. Stir the yolk just to break it up and add it a little at a time, pulsing after each addition. When the egg is incorporated, prices in long pulses-about 10 seconds each-until the dough forms clumps and curds. The sound of the machine will change just before you need to stop, so listen carefully. Turn the dough onto a work surface. To incorporate the butter into the dough, separate small amounts of dough from the pile and use the heel of your hand to smear each piece a few inches across the counter. In French, this is called fraisage and is an ideal way to finish blending the dough. At this point you can either roll out the dough or press it into your tart pan. If you choose to press it in your pan, you’ll butter the pan and then press the pieces of dough into the pan. If you want to roll out the crust, which is what I do, shape it into a disc and then place between two pieces of parchment paper. Roll the crust out into circle that’s about 3 inches larger than your tart pan. Carefully, slide the rolled crust into your tart pan or roll it around your rolling pin and unroll it over your tart pan. Don’t worry if it falls apart a bit, you can gently patch it back together. This is a forgiving crust. Shape into your pan and cut off the extra. Use a fork to poke holes over the bottom of the crust and freeze for at least 30 minutes or longer before baking. I’ve left it overnight with no difficulty. You want to fully bake the crust for this recipe, so heat your oven to 400 degrees F. Butter the shiny side of a piece of a foil and fit the foil snugly over the frozen crust. Place in the oven and bake for 25 minutes. Then carefully remove the foil and bake for 5-10 minutes more, until it’s firm and a golden brown. Place on a rack and let cool completely before filling. This is the fun part. Take the pastry cream out of the fridge and stir to loosen it up a bit. Fill the crust with the pastry cream and smooth the top. Then decorate with berries and fruit. You can make circles of mixed berries or scatter fruit as I did with the blackberries. I did plan my design a bit on the counter before I transferred it over to the tart because once you get cream on the fruit, it’s hard to fix. Other than that, it’s hard to make fruit look bad, so feel free to improvise! Try to assemble the tart as close to serving time as possible, but it can be put together and then refrigerated for a few hours if needed.